Born in Pennsylvania, Dr. Klenner received his medical degree from Duke University in 1936. After three years post-graduate training to specialize in diseases of the chest, Dr. Klenner continued his general practice. "His patients were as enthusiastic as he in playing guinea pigs to study the action of ascorbic acid. The first massive doses of ascorbic acid he gave to himself. Each time something new appeared on the horizon he took the same amount of ascorbic acid to study its effects so as to come up with the answers' (Journal of Applied Nutrition, 23: 3 & 4, 1971). Abram Hoffer writes: "In the early 1950s, Dr. Fredrick Klenner began his work with megadoses of vitamin C. He used doses up to 100 grams per day orally or intravenously. In clinical reports he recorded the excellent response he saw when it was given in large doses. For example, polio patients given vitamin C suffered no residual defects from their polio. A controlled study in England on 70 children, half given vitamin C and half given placebo, confirmed that none of the ascorbatetreated cases developed any paralysis while up to 20 percent of the untreated group did. This study was not published because the Salk Vaccine had just been developed and no one was interested in vitamins. Dr. Klenner's work was ignored." Dr. Klenner was the first physician to emphasize that small amounts of ascorbate do not work. He said, "If you want results, use adequate ascorbic acid." As a result of seeing consistent cures of a great variety of viral and bacterial diseases with huge doses of vitamin C, he published over twenty medical reports. 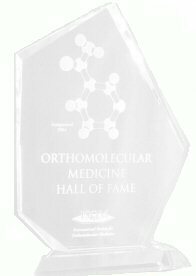 Orthodox medicine's rejection of his lifesaving work stands as a reminder to all medical mavericks practising today. "Some physicians," Klenner wrote, "would stand by and see their patient die rather than use ascorbic acid because, in their finite minds, it exists only as a vitamin."